Michael Aiken reveals how the church is spiritually unified and the problems of the denominational differences. WHAT? 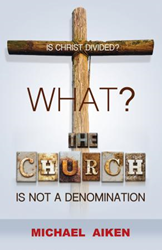 THE CHURCH IS NOT A DENOMINATION - IS CHRIST DIVIDED? I hope readers will comprehend that the church is not a divided entity, even though, it has many members. Michael Aiken’s new book, WHAT? THE CHURCH IS NOT A DENOMINATION - IS CHRIST DIVIDED?, ($9.99, paperback, 9781498456296) explores the meaning of denomination, the church, and how believers should function in the twenty-first century. It was written especially to believers – with a purpose to bring balance in the body of Christ and understanding the different types of church government. Apostle Aiken discusses important subjects for all the questions about diversities but is also fruitful for spiritual growth. Subjects include: Christ Built His Church not Denominations • Is Christ Divided? • The Carnal Assembly • Dwell Together in Unity • Sanctified, Holiness and Apostolic • You Shall Do Greater Works • and much more. Apostle Michael Aiken is Founder and Senior Pastor of Pure Word Ministry in Vance, South Carolina. He was born and raised in Manning, South Carolina. He is an Army Veteran and former Gospel Radio Announcer. He is presently the Mayor of the Town of Vance and the Chaplain of South Carolina Conference of Black Mayors. He has been preaching and teaching the Word of God for over twenty years across South Carolina, Maryland, Philadelphia, Pennsylvania and Georgia. Xulon Press, a division of Salem Media Group, is the world’s largest Christian self-publisher, with more than 15,000 titles published to date. Retailers may order WHAT? THE CHURCH IS NOT A DENOMINATION - IS CHRIST DIVIDED? through Ingram Book Company and/or Spring Arbor Book Distributors. The book is available online through xulonpress.com/bookstore, amazon.com, and barnesandnoble.com.